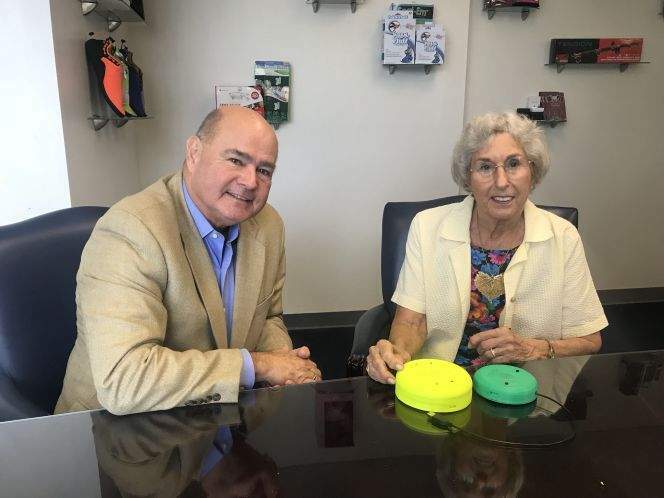 82-year-old Winter Haven resident invents device to prevent hot car deaths - CMS World Group, Inc.
CLEARWATER — A nontraditional inventor is on a big mission to confront a controversial issue. Carol Staninger, 82, of Winter Haven, joins the ranks of lawmakers, automobile leaders and other inventors seeking to prevent hot-car deaths. Her device — called SaveOurLovedOnes — alerts drivers and passersby that a small child, a senior citizen, a person with disabilities or a pet is inside an unattended vehicle. The system will check for the breathing cycle of individuals and pets when the driver leaves the proximity of the car. If there is any indication of life, the device will emit a loud sound and flashing light. Staninger couldn’t shake the idea of young children losing their lives in such accidents. Since 1992, more than 80 Florida children have died from being left unattended in a car. That’s 10 percent of all deaths nationally. So far this year, Florida ranks second in the nation, accounting for six of the 40 deaths from children left in vehicles, according to the nonprofit KidsandCars.org. Staninger wanted to find a solution. She said she wondered how NASA monitored astronauts sleeping from space. She figured that the agency must monitor astronauts breathing and believes the same concept could be applied inside a vehicle. The idea always lingered in the back of her mind. In February, Staninger saw a news feature about CMS WorldGroup, a Clearwater-based manufacturing firm, that helps inventors develop their ideas. She reached out to Austin Reeds, the vice president at the company. After hearing her pitch, Reeds invited her to meet the rest of the team. Within six months, they conducted research, created a prototype and began to test SaveOurLovedOnes. The product works by using two components. The wireless, self-installed detector is roughly the size a smoke alarm, which will be placed on the roof of the interior using Velcro strips. The second smaller device will be attached to the driver’s key ring. When the key device is out of proximity of the device, the detector will scan the car for any presence of humans or animals. The system’s detection technology is patent pending. If it does, the device will release two types of alarms using Morse Code SOS for help. An audible sound from the engine bay will blast as loud as a car horn, and an optical alert will flash to alert the driver or people near the car. A retired secretary at Winter Haven Hospital, Staninger said this is a passion project. She said she is not worried how much it will cost. She has invested close to $120,000 so far to develop and test the product, but will match that investment for manufacturing and marketing. CMS plans to launch the product next spring at retailers such as Babies R Us, Auto Zone and Walmart for about $300 apiece. The company has not pitched to any retailers but plans to attend CES, a global consumer electronic and consumer technology trade show, in Las Vegas in January. SaveOurLovedOnes is not the first product looking to prevent hot-car deaths. Some products use weight sensors, measure the car’s temperature, detect movement or monitor carbon dioxide levels, which may vary on alert timing. Other developers built technology within another apparatus such as a car seat. Staninger said her device is a passive automatic device that would work independently than any other equipment. Legislators from all levels have filed bills around this issue. In March 2016, Florida passed the ‘Good Samaritan’ law that allows bystanders to break into locked vehicles to rescue a person or pet from an untenanted vehicle without future legal action. “Any type of technology that can prevent senseless death of our children should be looked at,” state Sen. Dana Young, R-Tampa and a bill sponsor, said after hearing about Staninger’s product. Federal lawmakers introduced the HOT CARS Act of 2017 on July 31. If passed, it would require in newly manufactured vehicles sensors to alert drivers to check for kids and pets in the rear seats. The legislative proposal has passed the House and Senate Commerce, Science and Transportation Committee. Automakers are testing other child reminder solutions. Nissan and GM have introduced door sequencing technology. The system alerts a driver check the backseat if the back doors were opened during the trip. Hyundai created sensors that can detect movement in the rear seat. If someone is detected in the back seat when the driver leaves the car, a message will appear on the dashboard. If the driver proceeds to leave the car, the system will honk, flash and send a notification to the driver’s smartphone. The implementation of technology can take several years, said Amber Andreasen, the director of KidsandCars.org. For example, the industry mandated back-up cameras in 2012, but it won’t become standard in all new cars until next year. Contact Tierra Smith at tsmith@ tampabay.com. Follow @bytierrasmith.